They say you can get high on tea as much as on anything else. I have not tried this myself, and as the prospects are I won’t have to, since the old devils Peter Vill and Bob Partridge have a new delicacy for all of us resin junkies. 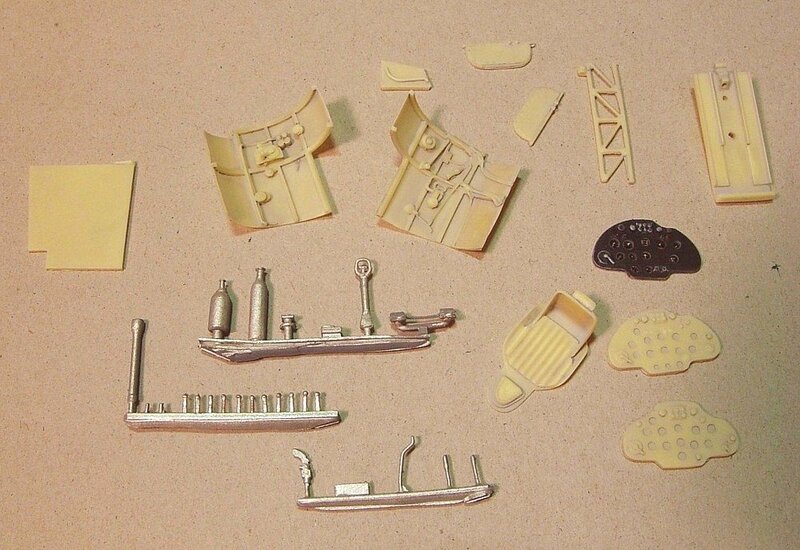 They master-modeled, and Airwaves produced, a most needed cockpit set for the Hobbycraft Polikarpov I-16 in 1:48 scale. I have a problem with “in-the-box / out-of-a-bag” reviews. I admire those people that can, cool as champagne, take all the sprues, examine them, photograph, and then neatly tuck them back in the box. I can’t do it. My instincts take over, and before you know, there is a scalpel in my hand, smell of solvent in the air, and something gets cut, drilled, painted, or worse. In the picture above you may notice that this happened to one of the unsuspecting instrument panels. [Ed Note: Treatment is now available, and very soon Aleks will be sent to Europe for evaluation by a Specialists; we wish him the best.] There is also a fuselage frame behind the pilots seat missing from that picture. Where is it? Well, installed in the fuselage, of course. I had to see if it fits. Yes it does, like a glove! Let me back track, and start with a proper introduction of the set. As far as I can count, it consists of thirteen resin pieces, and some 25 white metal bits and bobs on three sprues. The resin is my favorite vanilla colored Airwaves brew that sands and cuts just as styrene plastic. It is completely bubble-free, and with very little flash. 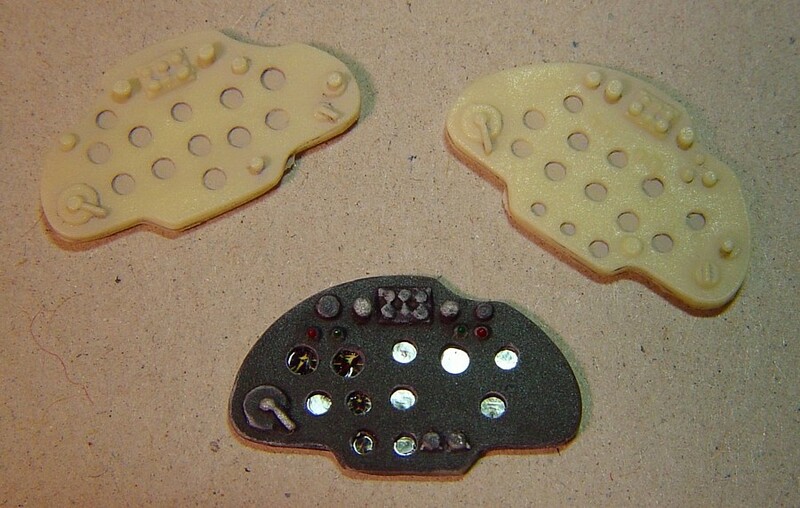 White metal parts are, well, just that, and they are also nicely cast (I would prefer these in resin too). All the parts came to me primed, so I rinsed them in thinner, and that actually helped to emphasize details in the photos, as some pigment remained in recesses. This cockpit set is very extensive, well researched, and accurate. 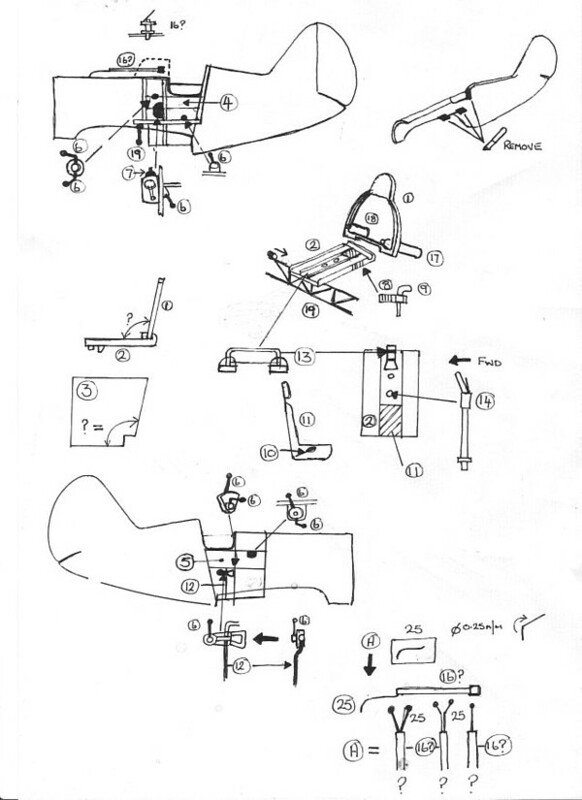 It will allow you to build authentic interior for any of the versions of this historic aircraft, from types 4 to 29. Once you delve into details of this set, you will realize that it is all there: early telescopic and later reflective gun sights, oxygen and nitrogen bottles, flare pistol and set of cartridges, central part of the wing spar, even a template for shaping a wire for front support of the telescopic gun-sight, and a block that serves for achieving the correct angle (not straight) between the cockpit floor and fuselage former-frame. Amazing! Central parts of the set are the two side panels. They are really more than that, as they fold under the elevated cockpit floor, as well as under the top in front of the cockpit, creating a sense of completeness. These contain all the structural details, engine controls, landing gear winch, and all of the pipes and hoses. Modelers just need to add control levers, and these are given as white metal parts (with some spares as well). This makes for very convincing cockpit. All details are crisp and the walls are very thin. 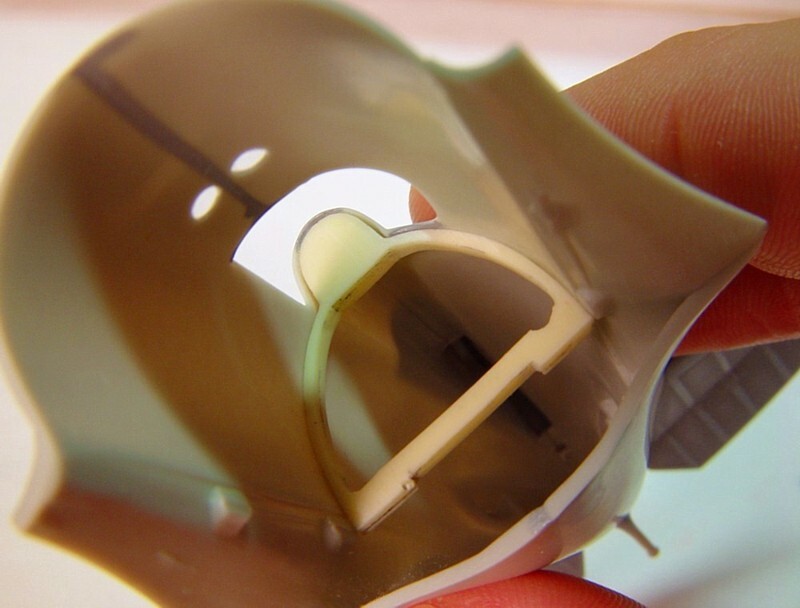 Care must be taken as they could warp or brake easily, but on the other hand this flexibility helps when fitting these parts to the curvature of the inner fuselage sides. 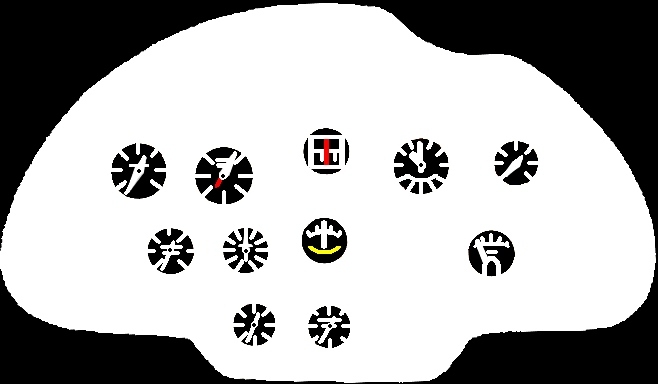 There are three different instrument panels given in the set. They are marked "4", "10" and “late” on the back of the part, relating to the specific type of the aircraft. I have mixed feelings about these. While it is commendable that one can differentiate between various instrument layouts, panels themselves are somewhat spartan. Instrument faces are blank and given as just recesses in the panel surface. The other knobs present on the panels are also somewhat fuzzy, although undoubtedly accurate in their position. 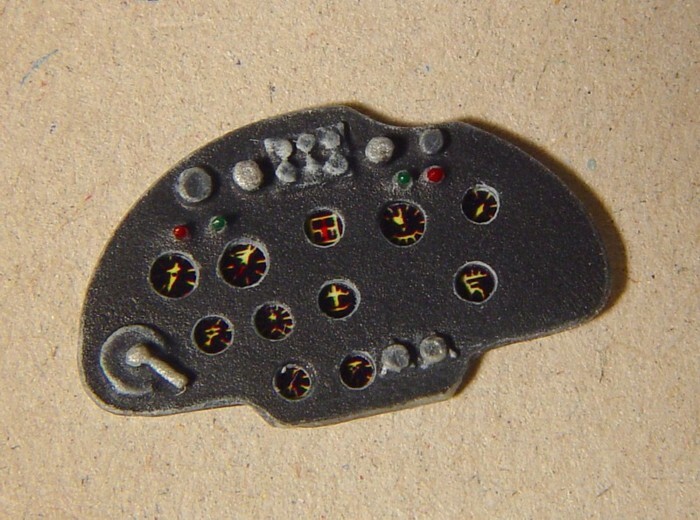 I would have preferred instrument panels as photo-etched parts with acetate film for instrument faces. This method became an industry standard, and it produces most convincing results on the model. With this said, it is not hard to achieve similar results with the resin pieces given in this set. I drilled through holes for all of the instruments with drill bits of the proper diameter. Then I laid the piece with its back down on the sheet of sand paper, and sanded off most of its thickness. After this I scanned this part (face down) to get a computer image of the instrument placement. With the magnified image I created simple instrument faces in a program for manipulating bitmaps, “MS-Paint”. This mask may look crude, but it’s actually optimized to show details when scaled down. If you try to add much finer detail to the instrument face, you’ll just end up with a black dot when you scale it to size; believe me, I tried.... After this is finished, print the scaled version of this mask on glossy photo paper. You may need to try it couple of times on regular paper to get just the right size. When the print dries, cover it with a cote of “Future” (Kleer in Europe), for that reflective glass look. Now, all that is left is to paste that mask on the back of pre-painted resin panel, just like you would do with photo-etched/acetate combination. Voila, home made instrument panel! This process may sound complicated but its actually very easy to do. 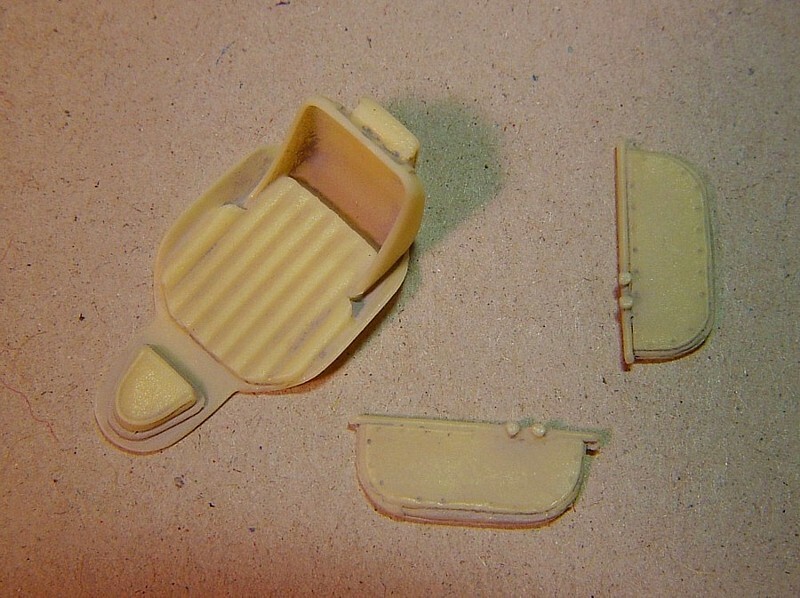 The pilot’s seat is given as one piece with the headrest and the back armor, and it is a very fine casting. Again, it would be nice to have a pilots harness, either in photo-etch, or cast-on, but it won’t be hard to make one. Two cockpit doors are given in the set. The modeler needs to consult the references whether to install starboard door, or not, as this one did not exist prior to Type 24. And so far as the instructions are of concern, I tried to be a pain in the back-end for Peter Vill, and make him improve these as much as possible. I think instructions are important, and there are many fine kits that fall on the nose due to poor instructions. Well, after some grumbling, this is the newest version that Peter sent me “fresh from the print”. In the production sets there may even be something more. 3. No internal painting at all. Landing gear/oleo struts - as underside (AII Blue, AMT-7, A-28m)"
I would like to thank Peter Vill for providing the cockpit set, Erik Pilawskii, as always, for his unmatched VVS color expertise, and Airwaves for producing this wonderful set.